"This handbook will be a valuable resource for many academic libraries. Many engineering librarians who work with a variety of programs (including, but not limited to Materials Engineering) should include this work in their collection. My recommendation is to add this work to any collection that serves a campus with a materials/manufacturing/electrical/computer engineering programs and campuses with departments of physics and/or chemistry with large graduate-level enrollment." Karen A. Reinhardt is Principle Consultant at Cameo Consulting in San Jose, California. Currently, Karen works with start-up cleaning companies to develop their technology for acquisition. Prior to forming a consulting company, Karen was employed at Novellus Systems, AMD, and Cypress Semiconductor. She has published more than 30 technical publications, has been awarded seven patents, and is co-editor of Handbook of Silicon Wafer Cleaning Technology. Richard F. Reidy (Ph.D., Penn State) is interim Chair and associate professor of Material Science and Engineering at the University of North Texas. He has conducted research in interconnect processing and characterization with over 60 technical publications and three patents. He is a member of the International Technology Roadmap for Semiconductors. 1. Surface and Colloidal Chemical Aspects of Wet Cleaning (Srtni Raghavan, Manish Keswani, and Nandini Venkataraman). 1.1 Introduction to Surface Chemical Aspects of Cleaning. 1.2 Chemistry of Solid-Water Interface. 1.3 Particulate Contamination: Theory and Measurements. 1.4 Influence of Surface Electrical Charges on Metal Ion Adsorption. 1.6 High Aspect Ratio Cleaning: Narrow Structures. 1.7 Surface Tension Gradient: Application to Drying. 2. The Chemistry of Wet Cleaning (D. Martin Knotter). 2.1 Introduction to Aqueous Cleaning. 2.2 Overview of Aqueous Cleaning Processes. 2.3 The SC-1 Clean or APM. 2.4 The SC-2 clean or HPM. 2.5 Sulfuric Acid-Hydrogen Peroxide Mixture. The Chemistry of Wet Etching (D. Martin Knotter). 4. Surface Phenomena: Rinsing and Drying (Karen A. Reinhardt, Richard F. Reidy, and John A. Marsella). 4.1 The Surface Phenomena of Rinsing and Drying. 5. Fundamental Design of Chemical Formulations (Robert J. Rovito, Michael B. Korzenski, Ping Jiang, and Karen A. Reinhardt). 5.2 Historical Development of Formulations for the Integrated Circuit Industry. 5.3 Mechanism of Stripping, Cleaning, and Particle Removal. 5.4 Components and Additives in Chemical Formulations. 5.6 Environmental, Safety, and Health Aspects. Filtering, Recirculating, Reuse, and Recycling of Chemicals (Barry Gotlinsky, Kevin T. Pate, and Donald C. Grant). 6.2 Bulk Chemical Distribution for Wet Cleaning Tools. 6.3 Chemical Distribution, Filtering, and Recirculation. 6.7 Chemical Blending, Recycling, and Reuse. 7. Cleaning Challenges of High-K/Metal Gate Structures (Muhammad M. Hussain, Denis Shamiryan, Vasile Paraschiv, Kenichi Sano, and Karen A. Reinhardt). 7.1 Introduction and Overview of High-k/Metal Gate Surface Preparation. 7.2 Surface Preparation and Cleaning. 7.5 Resist Stripping and Residue Removal. High Dose Implant Stripping (Karen A. Reinhardt and Michael B. Korzenski). 8.1 Introduction and Overview of High Dose Implant Stripping. 8.2 High Dose Implant Cleaning and Stripping Processes. Aluminum Interconnect Cleaning and Drying (David J. Maloney). 9.1 Introduction to Aluminum Interconnect Cleaning. 9.2 Source of Post-Etch Residues Requiring Wet Cleaning. 9.3 Chemistry Considerations for Cleans Following Etching. 9.4 Rinsing/Drying and Equipment Considerations. 9.5 Alternative and Emerging Cleaning Technologies. 10. Low-k/CU Cleaning and Drying (Karen A. Reinhardt, Richard F. Reidy, and Jerome Daviot). 10.2 Stripping and Post-etch Residue Removal. 10.3 Pore Sealing and Plasma Damage Repair. 10.4 Post-chemical Mechanical Polishing Cleaning. 11. Corrosion and Passivation of Copper (Darryl W. Peters). 12. Germanium Surface Conditioning and Passivation (Sonja Sioncke, Yves J. Chabal, and Martin M. Frank). 12.3 Surface Passivation and Gate Stack Interface Preparation. 13. Wafer Reclaim (Michael B. Korzenski and Ping Jiang). 13.1 Introduction to Wafer Reclaim. 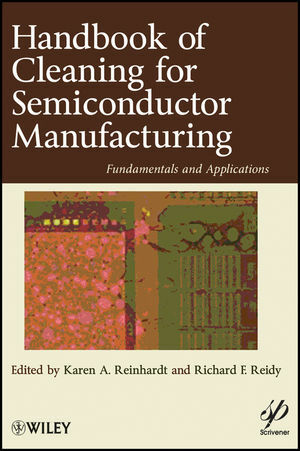 13.2 Introduction to Silicon Manufacturing for Semiconductor Applications. 13.3 Energy Requirements for Silicon Wafer Manufacturing. 13.4 Test Wafer Usage and Wafer Reclaim. 13.5 Requirements for Wafer Reclaim and Recycle. 13.7 Types of Wafer Reclaim Processes. 14. Direct Wafer Bonding Surface Conditioning (Hubert Moriceau, Yannick C. Le Tiec, Frank Fournel, Ludovic F. L. Ecarnot, Sébastien L. E. Kerdilès, Daniel Delprat, and Christophe Maleville). 14.1 Introduction and Overview of Bonding. 14.2 Planarization and Smoothing Prior to Bonding. 14.3 Wet Cleaning and Surface Conditioning Processing. 14.4 Dry Surface Conditioning Processing. 14.5 Thermal Treatments and Annealing. 15. Novel Analytical Methods for Cleaning Evaluation (Chris M. Sparks and Alain C. Diebold). 15.3 Recent Advances in Total Reflection X-ray Fluorescence Spectroscopy Analysis. 15.4 Advances in Vapor Phase Analysis. 15.5 Trace Metal Contamination on the Edge and Bevel of a Wafer. 15.7 Novel Applications of Electron Spectroscopy Techniques. 15.8 Novel X-ray Spectroscopy Techniques. 16. Stripping and Cleaning for Advanced Photolithography Applications (John A. Marsella, Dana L. Durham, and Leslie D. Molnar). 16.1 Introduction to Advance Stripping Applications. 16.3 Recent Trends for Photoresist Stripping and Post-etch Residue Removal. 16.5 Wetting in Small Dimensions and Cleaning Challenges. 16.6 Environmental Health and Safety. 16.7 The Future of Advanced Photoresist Stripping and Cleaning.